Expertly crafted in the traditional roll-and-cut manner from freshly milled, organically grown heirloom wheat. This special process yields Japanese style noodles with a smooth, silky texture perfect for your favorite Asian recipes. 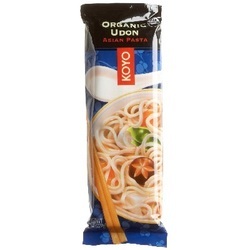 Enjoy this quick-cooking, nutritious Koyo Round Udon like spaghetti with topping or sauce, stir-fried, or in hot soup.